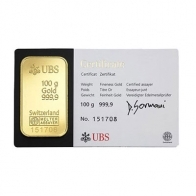 UBS gold bullion bars are available to clients looking to buy gold bars from SwissBullion.ch. 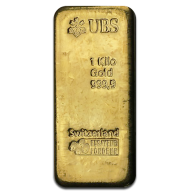 All UBS gold bars contain a minimum fineness of 999.9, and are manufactured by Argor-Heraeus on behalf of the bank. UBS is one of the most prominent banks in the precious metals field, and both UBS and Credit Suisse gold bars are highly coveted by bullion investors. Clients may buy UBS gold bars with Bitcoins, Cryptocurrency, USD, CHF, EUR and GBP. Bars may be purchased for tax-exempt Swiss storage or for delivery worldwide.